The infamous Hatterascal is back, as Hatteras Yachts has re-launched a lite version of our factory demonstration boat program by sponsoring and participating in leg one of the Bahama Billfish Championship at Orchid Bay Marina, in Guana Cay, May 7-10th. 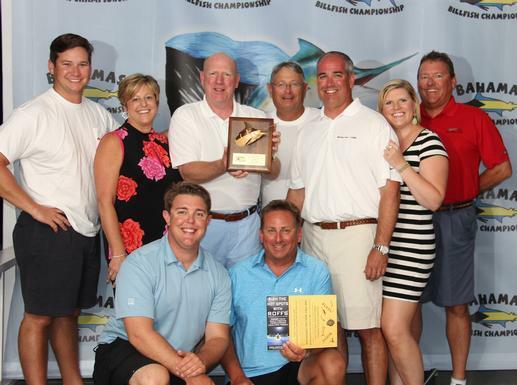 The Bahamas Billfish Championship (BBC) is the oldest billfish tournament series in the world and the prefect platform to kick off theHatterascal tournament season. Aboard the Hatterascal, was Hatteras dealers from Tom George Yacht Group- Mark Karamapelas, and Jimmy Rogers, and Ken Reda from Marine Max-Ocean Reef co-sponsor of the BBC. John Ward, President of Hatteras Yachts, also participated as the team had an exceptional three days of fishing in Guana Cay, Bahamas and was enthusiastic with the third place finish with our catch and release of a white and blue marlin and sailfish. “It is important that the sportfish consumer has a first-hand opportunity to see the type of performance, sea keeping ability and durability of a Hatteras. We have endured some challenging times in the past few years, but now with the support and backing of our new parent company, we strongly feel that the Hatterascal is the perfect branding platform in the sportfishing community to come back stronger than ever.” stated John Ward, President of Hatteras Yachts. The launch of this season’s Hatterascal lite program marks the renewal of a long-standing Hatteras tradition. Hatteras launched its first factory demonstrator early in its history in the mid-1960’s; she represented Hatteras at fishing tournaments, boat shows, owners’ rendezvous and special events for over 40 years. The Hatterascal is a Hatteras GT63. Equipped with twin CAT engines @ 1900hp, with a top speed of 40+ knots at full load, and power and ride to leave the competition in the wake. Built with long legs, the GT63 can make those long runs for all of sportfish enthusiasts.